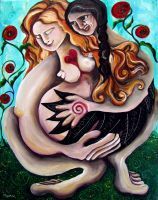 This is an intuitive painting of a dear friend and fellow artist, Miss Lucy Calhoun. Her work is unbelievable feminine and deeply rooted in the earth....so rooted I can smell the soil! You can see her work at her web site. The link is on my links page!